Gematsu goes hands-on with the weapons-based fighter reboot. Samurai Shodown will launch worldwide for PlayStation 4 and Xbox One in June, followed by Switch in Q4 2019 and PC at a later date, publisher Athlon Games and developer SNK announced. It will feature Japanese voice-overs and support English, Japanese, Traditional Chinese, Simplified Chinese, Korean, French, Italian, German, Spanish, Pan-American Spanish, and Brazilian Portuguese subtitle language options. The Unreal Engine 4-powered fighting game is a reboot of the classic series set between the events of Samurai Showdown V and the original game. It will feature 16 total fighters, including 13 returning characters and three brand new characters. Additional characters will be released via post-launch downloadable content. The public will be able to go hands-on with the game for the first time at PAX East 2019, which runs from March 28 to 31 at the Boston Convention Center. SNK will also host a panel, “Samurai Shodown: Resurrecting a Legend,” on March 30 from 4:30 to 5:30 p.m. ET featuring producer Yasuyuki Oda, director Nobuyuki Kuroki, original Samurai Shodown director Yasushi Adachi, and several other staff members from SNK. Get a new trailer and 44 minutes of Gematsu-recorded gameplay footage below, as well as our preview of the game and interview with producer Yasuyuki Oda, director Nobuyuki Kuroki, and game designer Joshua Weatherford. View a new set of screenshots at the gallery. I played about an hour or so of the new Samurai Shodown and it felt good—really good. I have stated this in the past, but I am not big on fighting games. I am generally not good at them and tend to only play for fun with friends. That being said, I went into playing Samurai Shodown without really caring much about it. But after some hands-on time with the weapons-based fighter, I am actually kind of hyped? Samurai Shodown is being treated as a reboot to the long-running series. Story-wise, it is set in 1787, after the events of Samurai Shodown V in 1786 and before the events of the original Samurai Shodown in 1789. While the Kansei reforms have been enacted by the newly appointed Matsudaira Sadanobu, a mysterious dark force is looming on the horizon, prompting the warriors of Samurai Shodown to gather and set out on individual journeys and fight for their own beliefs. Each character character has a different story. The game has a roster of 16 characters, 13 of which are returning from previous games. They are Charlotte, Earthquake, Galford, Genjuro, Hanzo, Haohmaru, Jubei, Kyoshiro, Nakoruru, Shiki, Tam Tam, Ukyo, and Yoshitora. The other three are completely new characters who have yet to be announced. I played as a few characters during my session, including Galford, Haohmaru, Nakoruru, and Jubei. As for stages, the stage selection screen appears to offer 13 total options. Playing round after round of Samurai Shodown, I learned that no two characters are alike and that a single strike has a ton of pull, as one hit can deal massive damage and significantly turn the tide of battle. The game is built atop various mechanics, starting with the “Rage Gauge,” which fills up the more you are hit. When the Rage Gauge is filled entirely, your attack power increases, special moves become stronger, and you can use a “Weapon Flipping Technique” to disarm your opponent. You can also deplete the entire gauge to activate a once-per-match “Rage Explosion,” which enables the use of a “Lightning Blade” attack in which the character leaps forward and uses a quick strike that deals heavy damage. Each character also has a “Super Special” attack that, like Rage Explosion, can only be used once per match. Each Super Special plays out a character-specific scene that reflects their personality or style. Nakoruru’s, for example, captures her resolution to protect Mother Nature while also illustrating her displeasure of fighting. The commands to activate these techniques are simple and the same across every character, which means that there is no need to memorize complicated commands for different fighters. Finally, there are also “Sword Clashes,” which occur when two attacks perfectly clash, prompting you to mash the attack buttons to retain your weapon and send the opponent’s weapon flying. 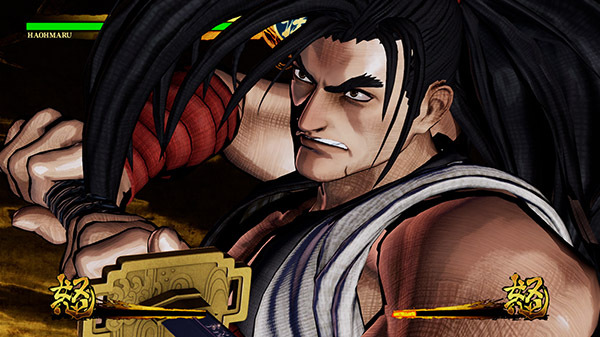 In terms of game modes, Samurai Shodown offers the classic Story Mode, an offline Battle Mode (which in itself includes modes such as Survival), an Online mode to compete against players across the world, a Practice mode (which includes Tutorial and Training modes), a Gallery Mode to view player-unlocked movies, artwork, and background music, and a new Dojo Mode in which you can upload and fight against your own “ghost data” or the download and fight against the ghost data of other players. Dojo Mode is an entirely new asynchronous online mode, which according to SNK utilizes “deep learning technology” to have the game’s artificial intelligence learn from your techniques and habits during offline mode gameplay to create a “ghost AI” character that both you and other players can fight against online. An “Ironman Challenge” mode in which players can try to fight 100 ghosts in succession is also being implemented. SNK even has a patent pending for Dojo Mode. Unfortunately, SNK is not saying more about Dojo Mode for the time being, one of the reasons being that the mode is essentially built off player data, which the team does not currently have. Visually, Samurai Shodown is an eyeful. From graphics to menus, everything is decorated in a traditional Japanese aesthetic—as is appropriate for its Edo period setting. That setting and visual design make the fighter stand out as something truly unique from the rest of the crowd. Samurai Shodown is by no means the most well-known name in fighting games, but with the release of this spectacular-looking reboot and its participation as a main title in the upcoming Evo 2019 tournament, I really hope that it gets more recognition. I really want to pick this one up and learn its ins and outs. This is the first new Samurai Shodown game in over a decade—the last new one being Samurai Shodown Sen for Xbox 360 and arcade in 2008. What was now the time for something new? Speaking of eSports, I think it’s safe to say a lot of people didn’t expect Samurai Shodown to be a main title for Evo 2019 in August. With the game due out in June, are you worried there won’t be enough time for players to learn how to play at a sufficient level? Moving on to characters, The King of Fighters XIV had a very generous starting roster of 50 or so fighters, compared to the 16-character roster of Samurai Shodown. Do you feel like that might be too little? And you guys aren’t showing the three original characters right now, but can you give us a hint? Woo, big giveaway there. (Laughs.) Anyway, while we’re still talking about characters, given the rising popularity of guest characters, is there a possibility that we’ll see fighters from other franchises appear in Samurai Shodown? Say there were no restrictions on which guest character you could include, who would you choose to add to the roster? How do you plan to draw in beginners or players who don’t normally play fighting games? Well, that about wraps up our time. Thank you for speaking to me! I wish you all a successful public debut at PAX East 2019!